I just noticed the driver is in a racing seat in those orange car pics. Seems a bit odd they would do that on this model at this stage. Do what? Test performance of a new model on the track? To have a race seat and harness (pretty sure he's got the harness but hard to see) you need a cage. I would think you would only be doing this if you were trying to set a lap time. My understanding (correct me if im wrong) was that these photos come from the normal manufacturers test sessions. It doesn't add up to me. These are still performance sports cars. They do get pushed to the limit as if they were trying to set a record. Each one that comes out tries to be better than its predecessor. 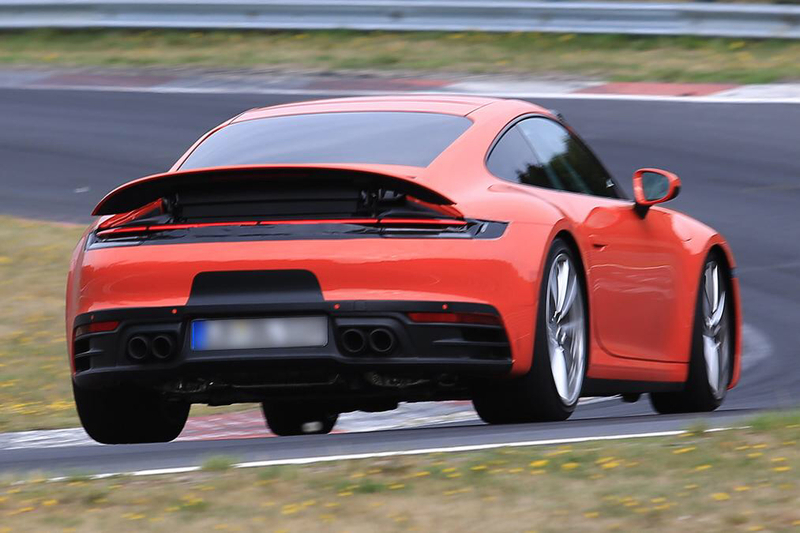 The 992 test mule is flying around the Nürburgring! Last edited by STG; 09-07-2018 at 10:26 AM. Noway! You must be kidding, how come they can break any record on the Ring with that joke of a gear lever and hideous clam shell spoiler? It's a smaller panamera, it's not manly, sporty, legendary enough, nobody will buy it etc. and with so much plastic and without sport package it should be disqualified immediately! At least the 959 along with every other 911 before the 991 had the BRILLIANT idea of putting the spoiler onto the engine hatch itself rather than as a separate piece so that there was a significantly larger opening to service the vehicle through. Each time they make changes in generation or mid cycle refresh, they make you more dependent on dealers. Geez, for 991.2, the front bumper needs to be taken off just to remove headlight units. They also use so many different fasteners, screw heads, etc ... a Porsche tech has a hard time keeping up and needs $10K+ of tools. They make nothing easy and over-engineer every trivial thing. Im not talking about setting a lap record, but setting a lap time for the car. That's the only time I would expect them to put a cage and seat in, but they wouldn't (never as far as I know) do this on a manufacturer's test day. Perhaps they are preparing for an upcoming lap time session so they can quote it in the official unveiling.... It just seems odd to me. it's a million of try and errors, really. To have a race seat and harness ... you need a cage. You don’t even have to wear a helmet to drive on the Nordschleife. Racing harnesses attach to the rollcage behind the driver's shoulders, hence why you need a rollcage if you're running harnesses - nothing to do with Nordschleife rules. Good catch. With the huge spoiler there is one less cut line, so unless the service access is under the engine grill, there are likely rubber covers under the spoiler to pop off to get to the oil and coolant caps and oil filter. It is really no trouble removing such stuff or the cover in the frunk for access to the battery/etc on the 991. They lift right off. The air filter access under the rear bumper cap is something else, but its only what, every 40 k miles?. I agree that it will take some getting used to viewed from the rear. But so did the ducktail, the whaletail and various wing appendages- all of which messed with the basic design line "purity" of the 911 to gain performance. I'd bet that except for the new spoiler, you will have to point out difference from the 911 to all but the most dedicated Porsche fans. Those mourning the "purist, analog" days ought to appreciate that there is no need for gymnastics over and under for valve adjustment and oil change every 3500 miles (despite the fun and community of Saturday PCA "tech sessions" at local shops for DIYers and hangers-on), and a clean/dry garage floor. Last edited by lecoultre; 09-07-2018 at 12:15 PM. The bumper cover and tail light removal to access the top of the engine is completely unforgivable and aside from the air filters anything that requires access up top from the belts,pulleys more major repair work down the line etc. all requires that first ridiculous step.. In the mid engine Cayman it's more forgivable for obvious reasons but for a rear engine car that should have very straightforward access, Porsche's recent disregard for that is nothing more than lazy , cost cutting and downright offensive to everyone involved after the initial purchase.